Top Overall Winners in The 2013 International Business Awards to Receive Grand Stevie Awards in Barcelona on 14 October. The Stevie® Awards have announced the winners of the Best of the IBA Awards in The 2013 (10th Annual) International Business Awards, the world’s premier business awards competition. This new addition to the IBAs' repertory of awards includes five best-of-competition prizes that are awarded to the organizations that submitted the best body of work to the competition, in their own name or in the names of one or more clients. The International Business Awards honor an all-inclusive spectrum of business people and organizations -- from non-profits, emerging start-ups, major public companies and government agencies, to corner-office executives, product developers, marketers and web development teams. This year’s IBAs received more than 3,300 entries from organizations in more than 50 nations and territories. Nominees in The 2013 International Business Awards were not able to apply for the Best of the IBA Awards directly. Winners were determined by a points system based on the total number of awards won in the IBAs, with a Gold Stevie Award win counting for 3 points, each Silver Stevie Award for 2 points, and each Bronze Stevie win counting for 1.5 points. This year’s Gold, Silver and Bronze Stevie Award winners in The International Business Awards were announced on August 14. Organization of the Year: Accenture, Chicago, IL USA. With 29.5 total points, Accenture is the most honored organization in the 2012 IBAs. Best of the IBA winners will also be granted the exclusive right to use a unique Best of the 2013 IBAs logo. More than 250 executives worldwide participated in the judging process to determine this year’s Gold, Silver and Bronze Stevie Award winners. For a complete list of Stevie Award winners in The 2013 International Business Awards in all categories visit www.StevieAwards.com/IBA. Stevie Awards are conferred in four programs: The American Business Awards, The International Business Awards, the Stevie Awards for Women in Business, and the Stevie Awards for Sales & Customer Service. A fifth program, the Asia-Pacific Stevie Awards, will open for entries next month. Honoring organizations of all types and sizes and the people behind them, the Stevies recognize outstanding performances in the workplace worldwide. 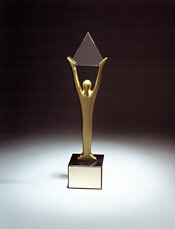 Learn more about the Stevie Awards at www.StevieAwards.com, and follow the Stevie Awards on Twitter @TheStevieAwards.